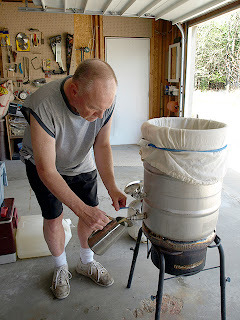 Today's video demonstrates the technique described several posts ago that I use to squeeze the most wort out of my grain bag. As always, your comments and questions are welcomed. Last weekend my brew bud Travis and I cooked up a batch of Kilkenny Irish Ale Clone. All went well. We had a nice even rolling boil. We use a 5 gallon paint strainer as a hops bag. We had clipped it differently than usual, around one half (almost) of the boil kettle and added hops as called for. Part of the elastic band at the top of the bag was stretched across the middle of the pot. 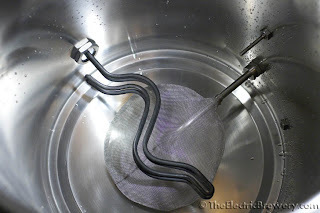 Here's the strange part....as the boil reached the top of the kettle, it overflowed into the paint strainer bag almost like a waterfall, as the wort in the bag was not bubbling/foaming up. We were happy that this was keeping the pot from boiling over, but it wasn't until we drained the wort that we saw something amazing. There was almost no trub or hot break in the bottom of the pot! Why? I appears that is was all filtered by the hops bag as the boil push it all up and over the side and into the paint strainer/hops bag. Is this a good thing? I'm really not sure, as many feel that some trub/hot break/cold break serves as nutrients for the yeast. I guess we'll see how the batch turns out and report back! Well, I found out that this technique can work TOO well! Last night I brewed a batch of Gumballhead clone (3 Floyds Brewing, Indiana), and maintained a perfect rolling boil for the entire 60 minutes. I was distracted by a pre-season football game, and did not realize that so much of the trub and break had been caught by the hops bag, that it had clogged it up, and almost no wort was in the pot. It was all in the hops bag! I went outside to watch the last minute of the boil, and noticed a burnt odor in the air. 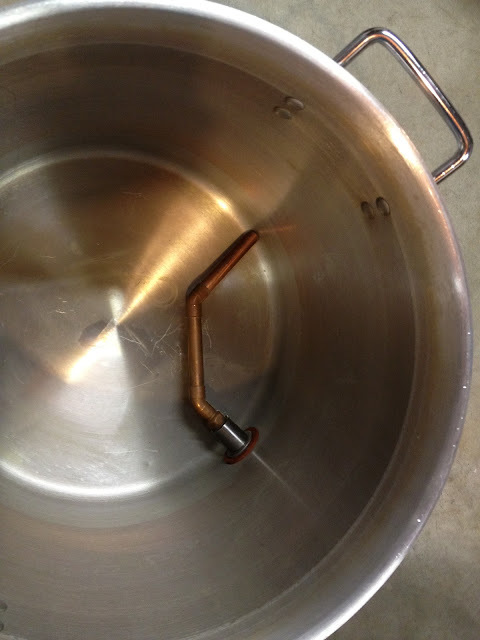 Turns out, my heatstick was at the bottom of the pot steaming away those last few ounces of wort that did not make it into the hops bag. Fortunately, my heatstick element is an Ultra Low Wattage version that does not burn out if fired outside of water. I used my long spoon on the inside of the hops bag to clear off the trub and hops to allow it to drain. The wort was nice and clear, and there was almost no trub in the bottom of the pot. The remainder of the session went OK, aside from the fact that I had boiled off too much wort, and my OG was about 10 points too high! I topped off the fermenter with tap water to make 5 gallons, and brought the OG back down to 1.056, pitched the S-05 and had bubbles from the blow off tube this morning! So, if you do try this method, be aware of the possibility of the hops bag getting clogged. 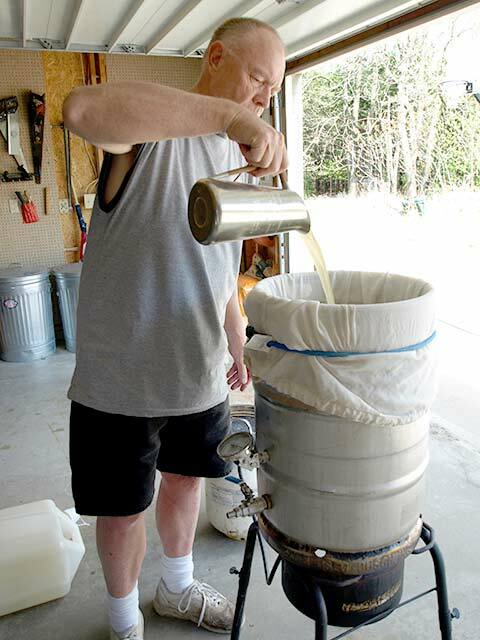 All of us Brew-in-a-Bag fans have experienced it; when the mash is finished and you want to get all of that sweet, precious wort out of the bag, you start twisting and squeezing the bag for all you're worth. Trouble is, that grain is still 150degrees or more and your hands can only take that so long. I've seen several ideas posted to address this, everything from high temperature gloves, to clamping two plates around the bag and tightening the clamps. After running through several designs for a bag squeezer in my head, I have settled on a solution that uses a caulking gun and a metal bowl along with my current setup to press the grain bag into submission. Below is a picture of my (as yet untested) idea. After removing the guide ring at the end that normally holds the front of the tube of caulk, I bent the ends of the metal rails to form 1/4 inch tabs that grab under the edge of the colander. 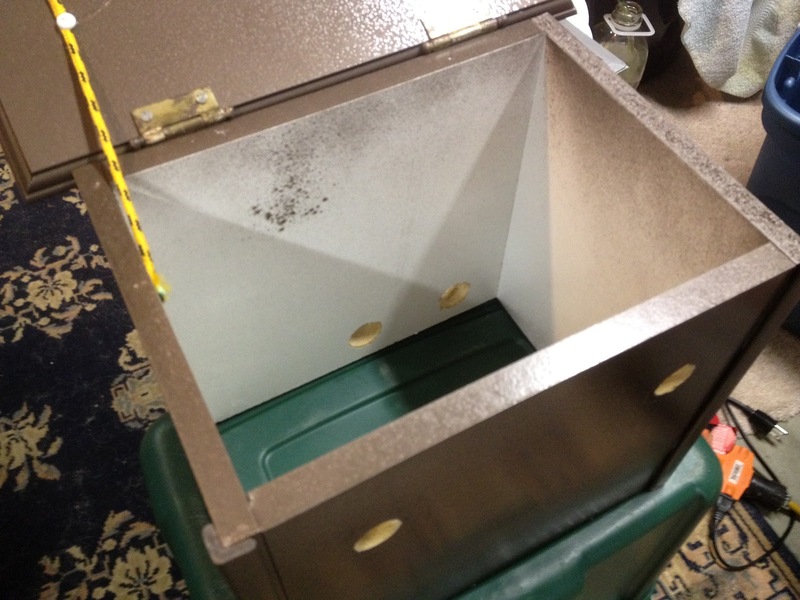 After that, I spread the rails and bent them to allow room for a plate or bowl to be fit inside above the grain bag. I have not decided what to use below the plunger to press against the grain bag. I have some stainless steel dog bowls similar to this that could work. But this round-bottom mixing bowl is cheap and looks like it could work also. If you have a favorite way to get the wort out after mashing, please leave a comment below. I'm open to new ideas! After deciding to go all-electric for my BIAB brewing setup, I considered how to control the heatstick. I wanted something more than an ON/OFF switch. 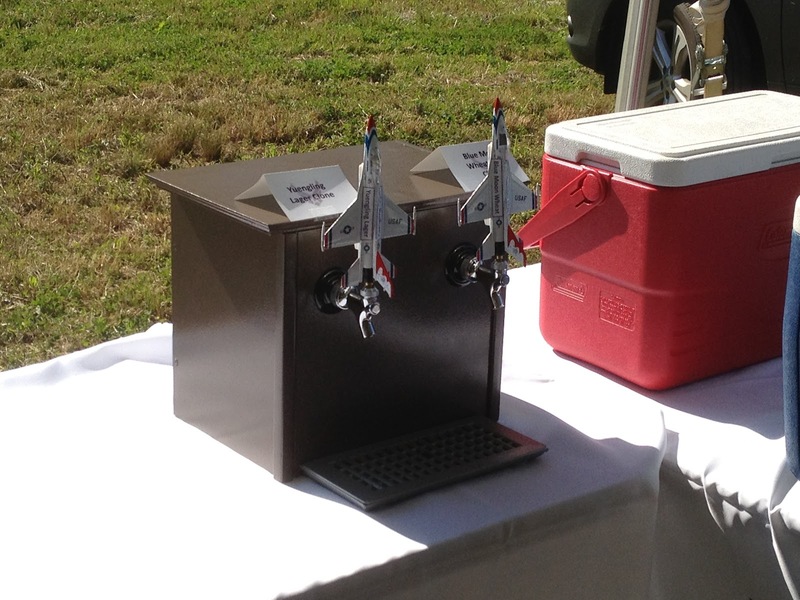 or simply plugging/unplugging the brewstick from the outlet. Originally, I did not consider a PID as adding a thermocouple into the mix was over-complicating things in my view. I settled on a design that was detailed in the Homebrewtalk forum and used a small circuit card to control a solid state relay which switched power to the heatstick. The picture below shows the semi-rat's nest inside my box. One day I hope to clean it up a bit. My apologies for not having it all prettied up like many of the other projects I have seen detailed. The first version of this box used the Control Board to turn on the relay every so often based on the setting of the potentiometer (round silver component on far side of box). By turning the knob on the outside of the box (connected to the potentiometer), I could control whether the heatstick was on for 1 second every 12 seconds, all the way up to 11.5 seconds of every 12 second interval. The relay switched one of the 2 phases of 120VAC to the heatstick, effectively turning it on and off. This worked OK during mashing (although still not ideal), but to get my pot up to boil, I needed the heatstick on all the time. To accomplish this I added the Bypass Switch (shown above) that bypasses the relay, and (when turned ON) keeps the heatstick on continuously. Once I got to a boil, I turned this off, and went back to the timer (technically a variable duty-cycle) approach circuit to control the heatstick. Since the heatstick is so powerful (5500W), I could not keep a constant boil using the timer circuit. The instant the timer switched off the heatstick the boil would stop. So I decided to buy one of the PIDs so often seen in homebrew projects to see if that would improve the boil as well as the mash temperature control. Mine was around $20 on ebay and displays temperature in degrees C.
With the PID installed, I was able to control temperature quite nicely by dropping the thermocouple into my pot and setting the digital controller (PID) to the desired temperature. I no longer need the Controller Board in the box, but have left it there because it provides a 9V voltage source that the PID uses to switch the relay on and off. I could replace it with a pull-up resistor, but I haven't gotten around to it yet. 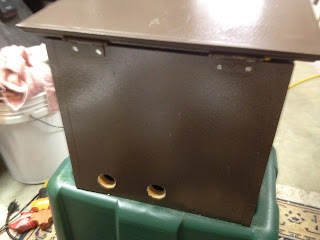 I did want to mention that I do have a ground wired through the box, and connected to the metal shank of the heatstick. The other protection that is the most important part of the system is the 2-pole GFCI circuit breaker that I installed in my breaker panel. This is what will save me if a short happens, as it did already once (my heatstick was not sealed properly with enough J-B weld...had to re-seal it..no problems since.) GFCI breakers monitor current flow in each circuit (i.e. both phases of 120VAC going to my box/heatstick) and if there is ever a difference (meaning there is a short to ground somewhere in the circuit) of as little as 2-3mA between their currents, the breaker trips. While the heatstick uses 240VAC, the way this is delivered is via 2 different phases of 120VAC that look like 240VAC to the heatstick. So, while you'll notice I have a warning sticker on the top of my relay saying 240VAC, it is actually only 120VAC going through the relay. The other phase of 120 is wired through the box directly to the heatsticks second terminal. Below is a functional block diagram of the entire box, including the unused Controller Board. Here is a picture of the top of the control box. Of course, I ordered a PID with Celcius readout, and I never did memorize that conversion formula....something like 9/5 times temp plus 32? or is that minus 32? Here is the box with associated wiring/connections. to the right is the thermocouple. The short white 120V plug at the bottom powers the PID. The gray 220VAC plug brings power into the box, and the black 10-3 cable coming out the top left is wired into the heatstick. As I did in my last post, my disclaimer here is that I am not a licensed electrician, and if you are not knowledgeable about electricity/electronics you should consult one. If anyone wants more details, let me know. This setup has been working great for me. I love the fact that I don't have to worry about running out of propane, and I can brew indoors in my basement shop in the winter, or during inclement weather. I know that the efficiency of a heatstick tops propane burners, as all of the energy from the heatstick goes right into the water. Thanks again to the entire brewing community for all of the ideas that I've borrowed from to end up with my system! I thought I had the perfect brew setup. 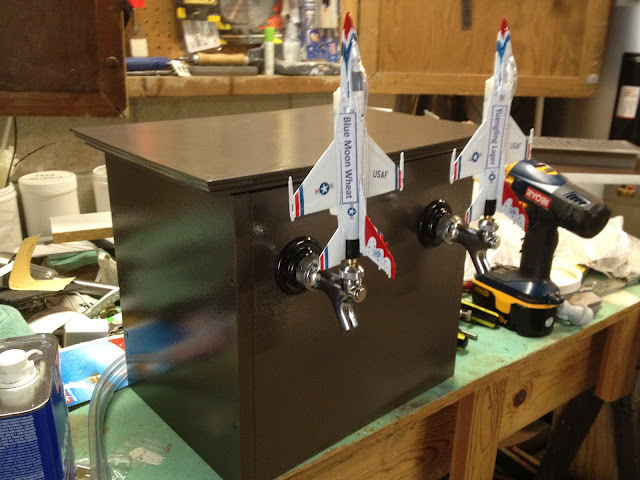 I had a converted keg that served as my single vessel BIAB solution. My electric heatstick system was working flawlessly, and my homemade voile bag was getting the job done. My plate chiller worked great, and I had fine-tuned my process to get my hot wort down to pitching temperature with an in-line thermometer assembly. Life was PERFECT! Then it happened....I saw it on Homebrewfinds.com one day 2 weeks ago....a 10 Gallon aluminum stock pot for just $41. Did I need it? No, but man it sure was tempting. I was getting tired of lugging that big old keg around that weighs 20+ pounds. Not only was it a bear empty, but with 7.5 gallons of water in it there was little chance I could lift it to the top of my brew stand. And clean up would be a breeze....no more reaching way down in that keg trying to loosen that nasty hot break, or hops that was seemingly welded to the sides. So I took the plunge and bought one. Two weeks later it had made its way across this great country by land from California. Upon opening it, I was amazed and disappointed all at once. It was light as a feather, and nice and shiny-new, but the advertisement had said it came with a steamer basket which was curiously missing. I was hoping that the basket would give me a way to pull my bag of grains out without too much squeezing. No luck...I'm corresponding with the company now to see what went wrong. In no time I had drilled a hole for the ball valve and verified that my voile bag should fit. There was no reason not to give her a try the next day, as I had just bought grains to brew up a New Glarus Spotted Cow clone. Here is how the set up looks during mash, not a whole lot different from before, but with the pot being shorter and wider, it's a bit easier to keep an eye on things. Hit my temps dead on with my high tech electric brewstick with digital controller. 152F for 60 mins, and 170 mashout for 10. I drew a few quarts of wort out of the bottom and recirculated it into the bag several times to keep the temperature even. No need for a $150 March pump! Thanks Bob Stempski! 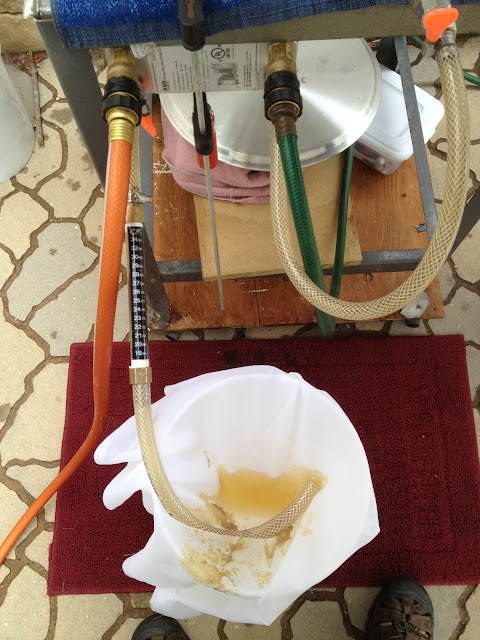 I recently started using some leftover voile to serve as a filter of the wort as it goes into the funnel/fermenter. This also helps aerate the wort. The hot break and hops that make it into the voile will actually clog it up, so having a large piece allows me to slide it around as this happens. Cleanup was a dream also. Just a quick brushing and rinsing, and I'm ready for next time. I did have to modify my siphon tube afterwards by adding an extra copper piece so that it extends to the edge of the pot. The only other change I need to make is to start with about a half-gallon more water. 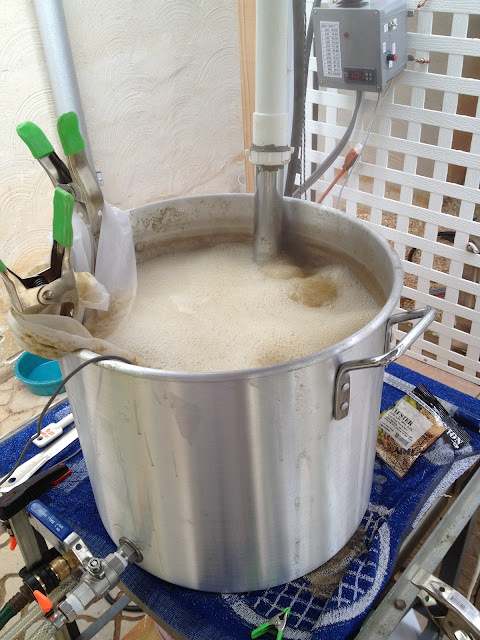 The larger diameter of this pot allowed more boil-off and I only ended up with 4.5 gallons of wort. I had been starting with about 7.4 Gallons, and will now need about 8 gallons. I use Beersmith, and I had to go into the Equipment section and play around with the numbers to get it right. So until I find a new way to improve things, I think my setup is perfect. If anyone has questions, please feel free to post them below. I have been thinking of making a few videos to discuss my process/setup so let me know if that would be of interest, or if you have other topics you'd like me to take a shot at. One of my frustrations with the BIAB method is that once mashing is complete, I feel that too much of the wort remains in the bag. And even though a "stuck sparge" is supposed to be impossible with BIAB, there sure does seem to be too much sweet wort trapped in the grain bag that is unaffected by gravity while it hangs above my keggle. 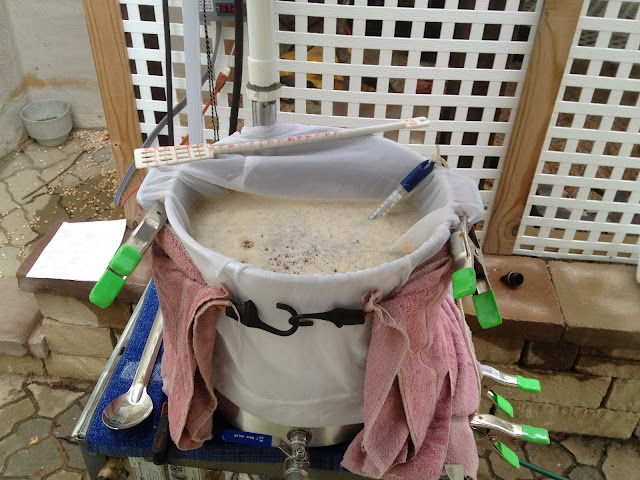 I've tried spinning the bag to squeeze wort out, and I've put the grain bag in a collander on my keggle and tried to push on it and squeeze as much out as possible without burning my hands. With either of these methods I can usually hit my numbers, but I'd like to figure out a way to avoid all the squeezing, pressing, etc. 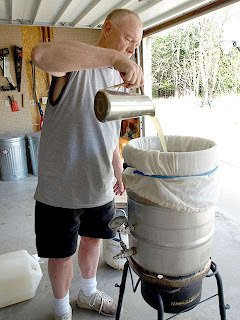 I referred back to John Plamer's How to Brew book to try and get a scientific explanation of the sparging/lautering. Appendix F of the book discusses the fluid dynamics of water through a traditional cooler mash tun grain bed. In this case, the grain bed is only being affected by the downward force of gravity. There is no lateral force on the sides of the grain bed, so the flow resistance is determined solely by the weight of the sparge water flowing through it, and the weight of the grain bed itself. For BIAB method however, the grain bed/bag is also subjected to the lateral pressures of the grain bag itself, which push the grain particle closer together, increasing the flow resistance for the wort. To prevent this, I plan to use a cake rack (or similar) to prevent the bag from collapsing around the grain bed as the bag is pulled from the vessel. I have not determined if placing the rack inside the bag or under the bag is best. I'm hoping to try this in the next week when I brew up a Gumballhead clone. I'll report back my findings. In the meantime, please let me know your thoughts on this and any other ideas you have to allow wort to flow more freely from the bag. In this post, I'll lay out the details of the electric (heatstick) based system that I have been using. As I mentioned in my previous post, an electric system was what I settled on after considering a propane system. There seems to be some trepidation in the brewing community regarding systems that involve water and electricity, and with good reason. If you don't have your system properly designed and installed it could mean a nasty shock at the least, and death at worst. Without a good understanding of electricity, putting together an electric heating system is a daunting task, and is probably one reason why propane is more popular, at least for now. Since my background is in electrical engineering, I was somewhat less intimidated with this approach, although I have to admit that I still had to do a lot of reading to convince myself that I wanted to embark on this path. 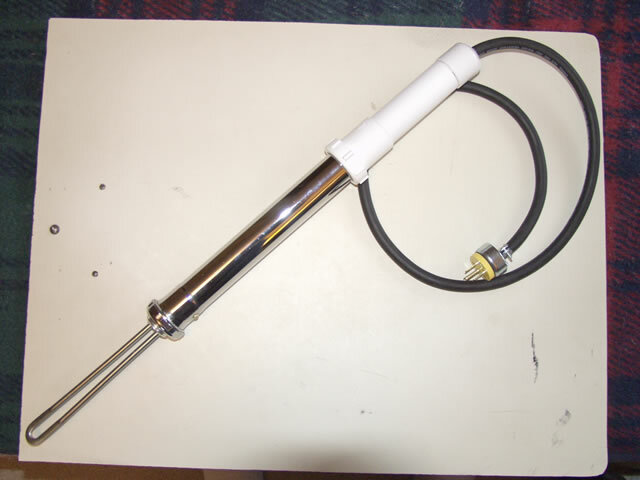 I had seen several sites that described a heatstick constructed of a water heater element attached to several standard 1-1/2" drain pipe components. Most used 120VAC elements which was convenient for plugging into a standard outlet. I was more interested in a higher wattage element that would be capable of quickly bringing 5-10 gallons of water up to mash temperature (~150 Degrees F) in a reasonable time (10-15minutes). These higher wattage elements required 220VAC, similar to what your electric clothes dryer needs, meaning that I'd need to have a 220VAC outlet installed where I wanted to brew (my basement shop and my garage). Also, I wanted a way to vary the heatstick output so I needed a way to either vary the voltage or the duty-cycle. I chose the latter after reading a thread on Homebrewtalk.com that detailed how a Pulse-Wave Modulator circuit board from Bakatronics could be used to turn on and off a solid-state relay (you'll want this heatsink too) to control the heatstick. 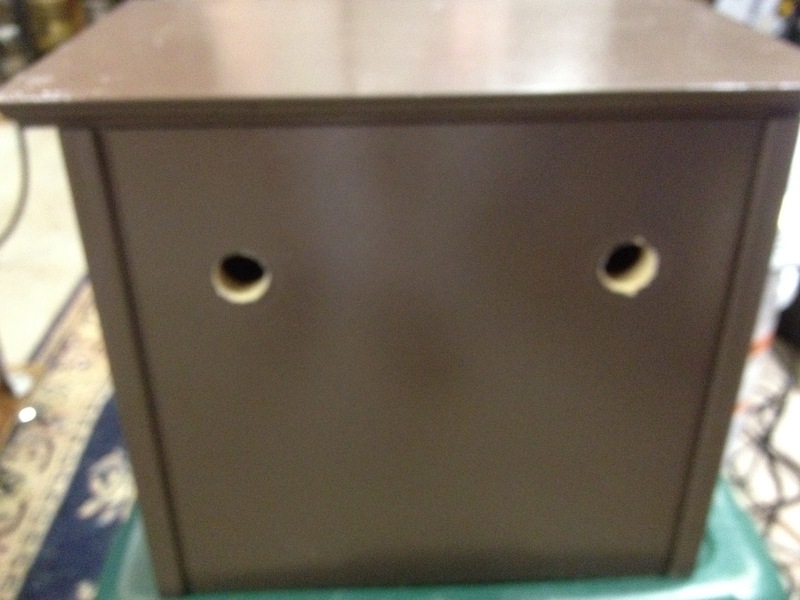 The picture below shows a box from HomeDepot that I used to mount the circuit board and the solid stat relay. Without going into all the details, I ended up with the system shown below, which (with one exception) has serverd me well in the last 6 months of brewing. The element sheath is made from Incoloy 840 and the interior is filled with a highly compacted ceramic powder. Bending an element creates gaps in the ceramic that cause high temperature spots. A tighter bend radius gives larger gaps. The larger the gaps are, the higher the temperature will be. High temperatures will reduce the life of the element. If the bend is too tight the element will crack. Too address the difficulties, we use specialized bending equipment and compression dies that we have developed just for these elements. 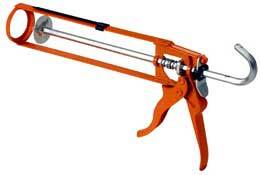 I don’t recommend bending the element, but if you can't find a way around it, use the largest bend radius possible. I've recently purchased a digital temperature controller that I plan on using to control the heatstick in lieu of the PWM circuit board I now use. More details on that to follow. 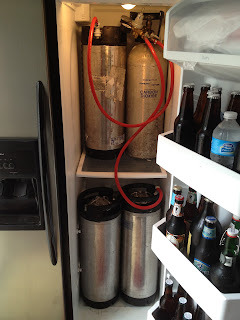 In my next post, I'll discuss a few important tips for beginning homebrewers that I learned about the hard way including temperature control of the fermenter, and proper yeast pitching. Stainless-steel vessel that could hold entire water volume. Plate chiller for cooling the wort. Let's walk through my reasoning for each. 1. Electric-powered system. When we started making extract kits, we used our stove to boil 2.5 gallons or so of water. No big deal. An electric stove or gas will work. Moving to All-Grain requires 6+ gallons of water to be heated. To heat this much takes more heat than your stove is able to provide, so the most popular solution is to get a propane burner/stand and move the operation outdoors. For me, the thought of having to lug propane tanks around was not attractive. Also, propane offered no way to brew indoors during the winter months. Add to that my general fear of gas leaks/explosions and propane quickly was ruled out. Plugging something into an outlet with no worry of running out of fuel made it easy for me to decide on an electric brewery! 2. Stainless steel vessel - Here, I have to admit that stainless is not a requirement. At the time I made my decision on stainless I had read about the possibility that aluminum vessels could impart a bad taste to the beer. Since then, my son has used an aluminum pot with no issues so if I were to do it over again I may opt for an aluminum brew pot. As it turned out, I found a keg for sale on Craigslist and purchased it. Having a 15 gallon vessel is nice since it allows me to brew a double batch in one session. It's nothing fancy, but here is my keggle. I do want to give a plug to Bargain Fittings.com, as they have great pricing on all that you need to convert a keg into a brewing vessel. That's a weldless bulkhead kit of theirs installed at the base. 3. Plate Chiller for cooling the wort - I had attended several group brews with my brew club and saw both the copper coil type wort chillers and the plate chillers in action. Most guys were using the copper tubing type, but I was looking for something smaller than a big coil of copper tubing. I was told that the plate chillers were pretty expensive, but I found a nice on at Keg Cowboy for a reasonable price and decided to go with it. I have not regretted this decision as it quickly cools the wort down to pitching temperature once you get the wort flow and cold water flow right. I made the mistake of ordering it with standard hose fittings instead of quick-connects, so after a few brews I made the trip to Wal-mart and bought/installed them myself. 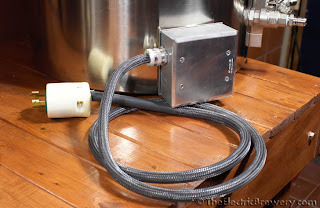 My next post will detail how I constructed the electric heating system for my electric brewery. Stay tuned! And please feel free to post a comment and/or questions regarding the setup. Thanks!